What happens to otherwise pleasant people when they cross the threshold into the big box world? 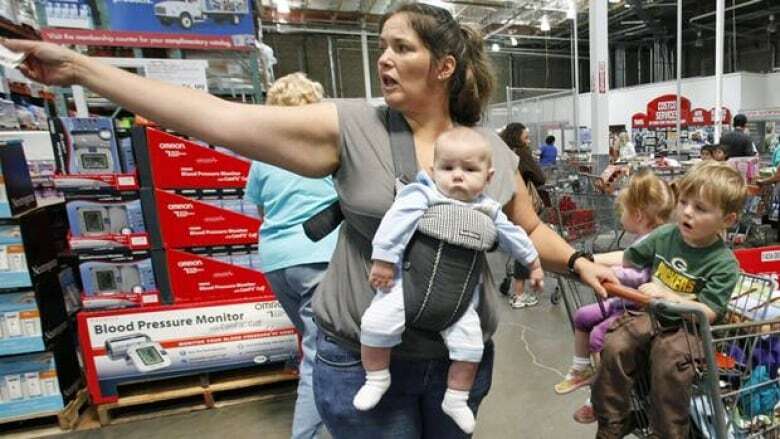 It turns out we're hard wired to act like hunter-gatherers when we get into stores like Costco. Shoppers scurry across a Costco parking lot in Calgary with colossal carts full of jumbo toilet paper and pork tenderloins by the dozen. Many of them don't seem particularly thrilled to be there. Bonnie, one such shopper, admits the whole experience has made her rather cranky. "It's the way other people act. It gets to me and then I become part of the problem. Some days are pretty good. Today I wasn't in the mood," she said. She's not alone. It turns out we're hard wired to act like hunter-gatherers when we get into big box crowds. The battle for a parking spot, the lineups outside the store, the oversized carts clogging up the aisles — it's enough to put even the most seasoned Costco shopper on edge. Yet they are willing to buy a membership just to shop there. And there are plenty of Costco shoppers in Canada. With revenue from its Canadian operations ringing it at $17 billion US last year, versus $86.6 billion in the U.S., the company makes significantly more, on a per-capita basis, on this side of the border. So what happens to otherwise pleasant Canadians when they cross that threshold into the big box world? Bargain hunting gives many shoppers an adrenaline rush that's very similar to the one we get in competitive sport, says Nancy Puccinelli, a marketing professor at the University of Bath who holds a psychology degree from Harvard. "We actually refer to it as the treasure hunt phenomenon. It's almost competition with other consumers to find that treasure." So you're not so much shopping with people, you're shopping against them. Puccinelli says the layout of Costco stores just makes everything worse. "If you think of the types of carts they're making available to people, the layout, that does make it more difficult to find things. We know that customers don't like really high shelves. And in fact, one of the things that CVS [an American pharmacy chain] did was make a conscious decision to lower the height of their shelves because they knew that 80 per cent of their customers were women. And so even though they knew they were taking a huge loss on inventory, they did it because they knew their customers preferred it aesthetically." While there are bargains to be found at other grocery chains for those looking to bring out their inner-primitive competitive streak, the Costco experience stands out as particularly aggravating on a busy day due to the crowds. Crowd dynamics are something that Wendy James, who holds a PhD in psychology, has written about before. "A common psychological term is group polarization. It's the tendency for people in crowding areas and groups to become more extreme in their views. There's a theory called contagious theory. They become irrational and emotional. And their charged behaviour becomes a crowd frenzy." To help deal with these emotions, retail environments are painstakingly designed by many big chain stores. Mellow music, for example, has been found to relax shoppers in busy environments. Less busy stores have seen improved sales while upbeat music plays in the background. 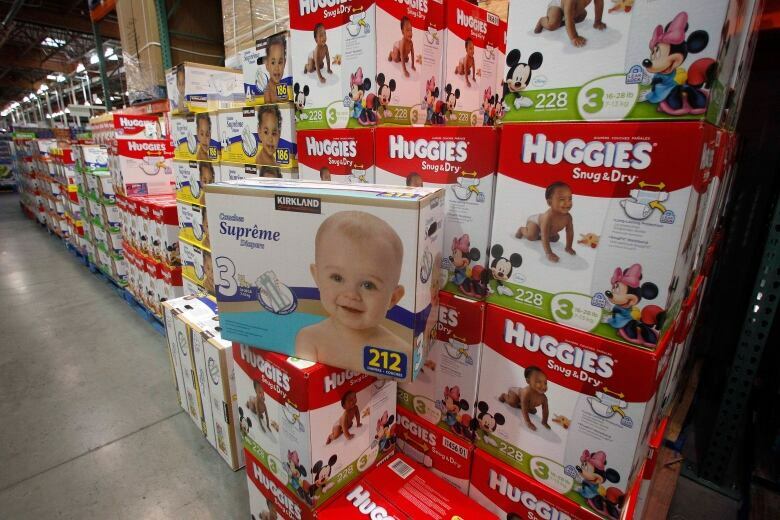 Other big box stores are finding creative ways to keep the cranky factor down, too. Another store known for big crowds, The Real Canadian Superstore, introduced its click and collect program a few years back. People order their groceries online and then for a small fee, they are delivered to your car right in front of the store. The uptake has been even bigger than expected, with shoppers buying three to four times more stuff online than if they go into the store, according to Superstore's parent company. 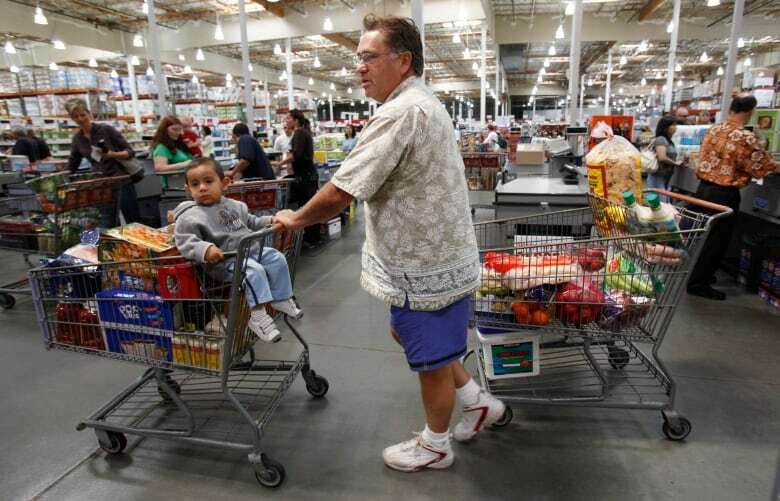 But one thing that might surprise you about the average Costco shopper is that even though they love the thrill of the bargain, Puccinelli's research shows that people don't go to Costco because they need to save money. Instead, a typical Costco shopper earns $30,000 to $40,000 more than average, which is why we're seeing more high-end products like pine nuts, organic olive oil and pomegranate juice. An earlier version of this story incorrectly identified Costco's total revenue from its Canadian operations as the company's Canadian profits. Paul has been with CBC since 2005. He's the director of the Calgary Eyeopener and CBC Calgary's ski and outdoor lifestyle reporter.